If you’ve been paying attention to the various app store charts in recent months, you may have noticed a little game called Ruzzle appear from time-to-time. In the nuttiest of nutshells, Ruzzle is a social word game where you challenge friends (or strangers) to see who can find the most words in two minutes. You then score off as many words as possible with a deft swipe of the finger. The game garnered attention almost immediately when it launched early last year, but interest was initially confined to its domestic market in Sweden, as well as Denmark, Norway and the Netherlands. But some time late last year, that all changed…and things really took off. In a big way. Launching for iOS in March 2012, followed by Android a month later, Ruzzle notched up one million downloads three weeks after launch, escalating to a cool five million by October, and then six million by early December. A month on? Well, there are now eleven million people playing Ruzzle – seven million on iOS and four million on Android. This exponential growth looks set to continue too, as we’re told that this number is growing by two million each week. Moreover, forty million rounds of Ruzzle are played every day, across one hundred countries, aided by its availability in ten languages – English, Spanish, French, Italian, German, Dutch, Brazilian Portuguese, Swedish, Danish and Norwegian. It has been the number one word game in the App Store in fifty countries, and a top ten word game in 128 countries. Total play time of Ruzzle? More than 7,000 years since launch, notching up an average score of 4.5/5, across 60,000 ratings. These kinds of numbers and factoids are too difficult to ignore, so we tracked down the good folks behind Ruzzle to see who they are, how their game came to be and where things could go from here. 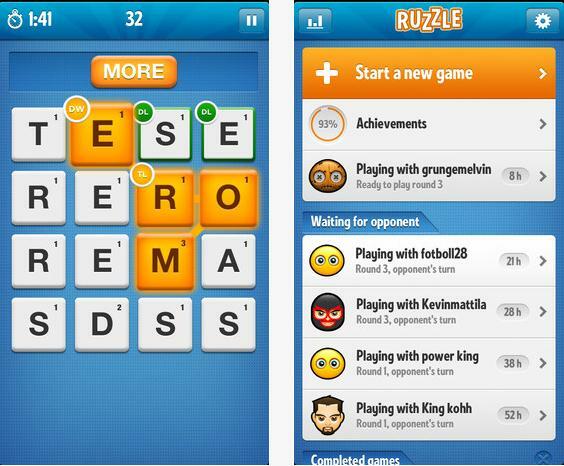 The company behind Ruzzle is Mag Interactive, an independent Swedish app development studio based in Stockholm. Founded in 2010 by Daniel Hasselberg, Roger Skagerwall and others, the company now has ten employees, who have produced more than ten apps for external clients, plus two for themselves…Ruzzle, and the recently launched QuizCross. But what we really want to know about just now is Ruzzle. Although the app was already popular in local markets within a month of launch, the scale at which it started to grow at was perhaps the real surprise for Hasselberg and Co. And he’s not entirely sure how the boost came about, though he is sure that social media had a big part to play. But then December happened, and things went a bit nuts. What now for Mag Interactive? The easy route would be to pull a move directly from its Finnish neighbor’s Rovio’s book. When it landed a hit with Angry Birds, all its efforts were then focused on that game, to the point where there’s theme parks and Star Wars tie-ups. As a word/puzzle game, Ruzzle perhaps doesn’t lend itself to such antics, but is it safe to say they’ll be getting as much mileage from this hit as they can? “After the initial success last year, we decided to leave everything else to one side, and focus 100% on building social games,” says Hasselberg. So it seems that they’re looking to take what they’ve learned from Ruzzle and apply it to other games, rather than resting on their Ruzzle laurels. QuizCross is the company’s first post-Ruzzle foray in the app world, and things have gotten off to a decent start there. It’s only available on iOS for now, but an Android version is coming this month, and the existing incarnation of QuizCross is currently a top 5 app in Sweden. And speaking of hit social games, this sounds a lot like another behemoth in the space. So…would Hasselberg be open to jumping on board the Zynga bandwagon if they came calling? “Selling the company is not part of our plan,” he said. Looking beyond Ruzzle and QuizCross, Hasselberg says they have a few other games in the prototype stage just now, though they’re not giving any specifics away around launch dates. Though it’s safe to say there will be at least a couple more Mag Interactive games out by the end of the year…whether they can replicate the success of Ruzzle, remains to be seen. Oh, and the Windows Phone version of Ruzzle is currently receiving a spit-shine ahead of an imminent roll-out. Finally, I asked Hasselberg what it was about social puzzle games that he liked…given that this is quite clearly where they’re setting up their stall. “Yes, we like social games that challenge your mind a bit,” he says. “They tend to be more addictive – in a positive sense – given that you feel you can improve and that the game play is not a waste of time in the same sense as when you’re ust running the same course over and over again. So, we can expect to see more ‘stickiness’ from the Mag Interactive folks later this year. And it’ll be interesting to see where Ruzzle goes from here…the way things are going, the only way is up. Meanwhile, you may also be interested in the story of ‘Pah!’, the voice-controlled game that took the mobile world by storm.